Maggie Mitchell (1832-1918) was a famous American actress, born in New York. 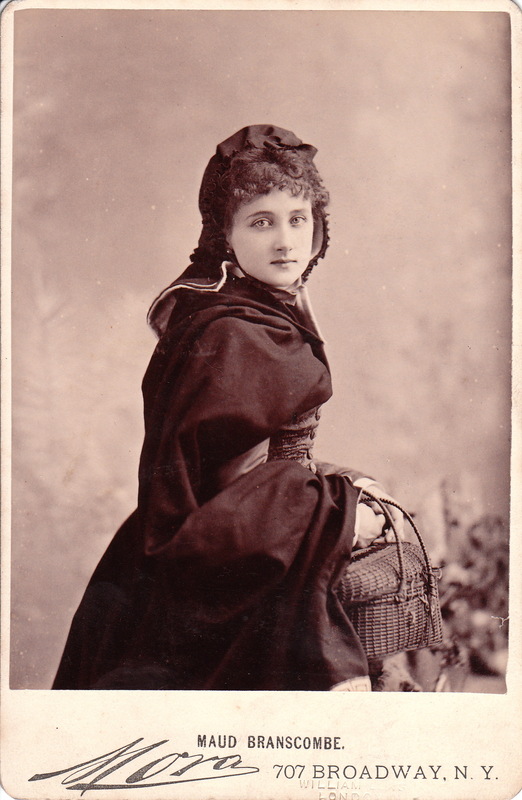 Her first regular stage appearance was in “The Soldier’s Daughter” at the Chambers Street Theatre in 1851. Her first major success was as star of “Oliver Twist”. She has been described as small, agile and energetic, with a special talent for comedy. In 1860, she appeared in “Fanchon, The Cricket” which was adapted for her from a George Sand novel. She performed in this and other plays in front of President Abraham Lincoln. The photographer of the top image was celebrity photographer, Mora, of New York City. To view other photographs by Mora, click on Cabinet Card Gallery’s category, “Photographer: Mora”. The second portrait of Miss Mitchell was taken by the esteemed Philadelphia photographic studio, Gilbert & Bacon. 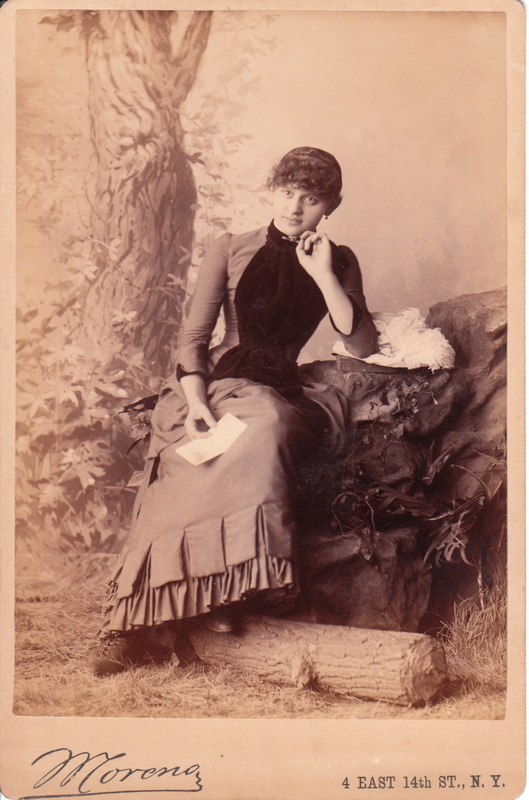 This cabinet card image shows Maggie displaying a “come hither” expression. To view more photographs by this studio, click on the category “Photographer: Gilbert & Bacon”. 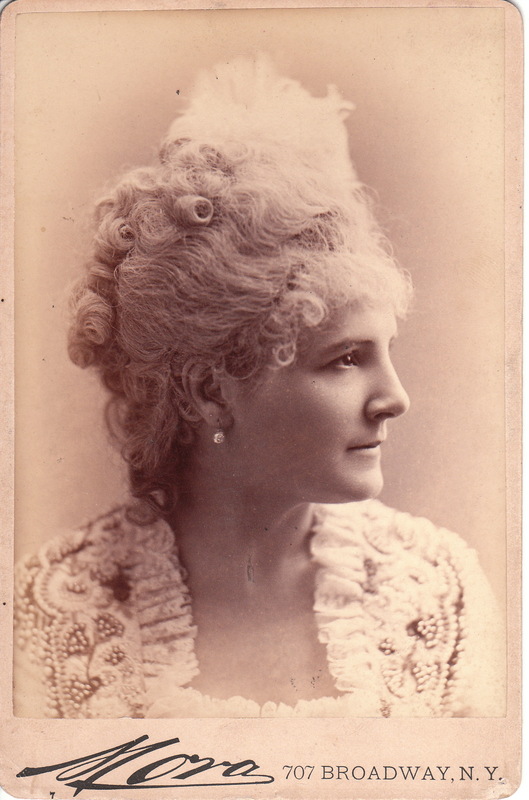 ADDENDUM: A knowledgeable visitor to Cabinet Card pointed out that the second photo of Miss Mitchell is actually actress Lotta Crabtree (see comment below). A bit of research confirmed his astute observation. Lotta Crabtree, a woman who led a very interesting life, will receive her own entry in the cabinet card gallery in the next few days. 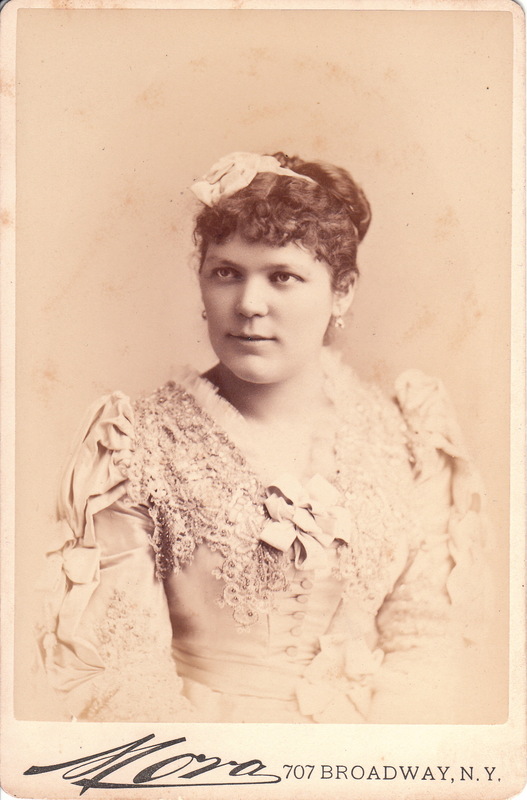 This cabinet card portrait features Hungarian soprano Etelka Gerster (1855-1920). She debuted in Italy in 1876. In 1878 she performed at the Academy of Music in New York City. She earned great international acclaim during her singing career. She unfortunately lost her voice after the birth of her daughter and never sang again. She became a voice instructor and taught singing in Berlin, Germany between 1896 and 1917. She died in Bologna in 1920. This cabinet card portrait was produced by celebrity photographer Jose Mora of New York City. To learn more about him and to view more of his photographs, click on the category “Photographer: Mora”. 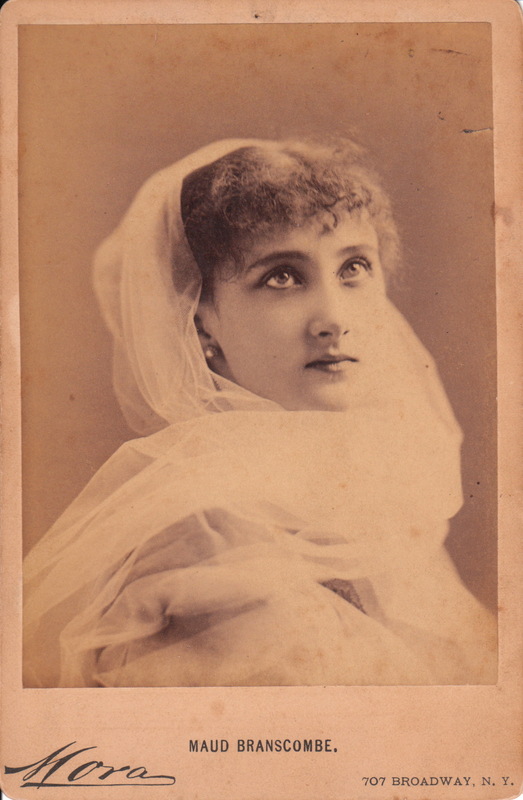 The top Cabinet card, by Jose Mora of New York, features actress Mlle. Rhea (1843-1899). Mlle Rhea was her stage name. She was actually Mlle Hortense-Berbe Loret and was born in Belgium to French parents. She began studying acting at age 20 upon the suggestion of an actor that she had met at a party. Her decision was also prompted by the death of her mother and financial reversals experienced by her father. 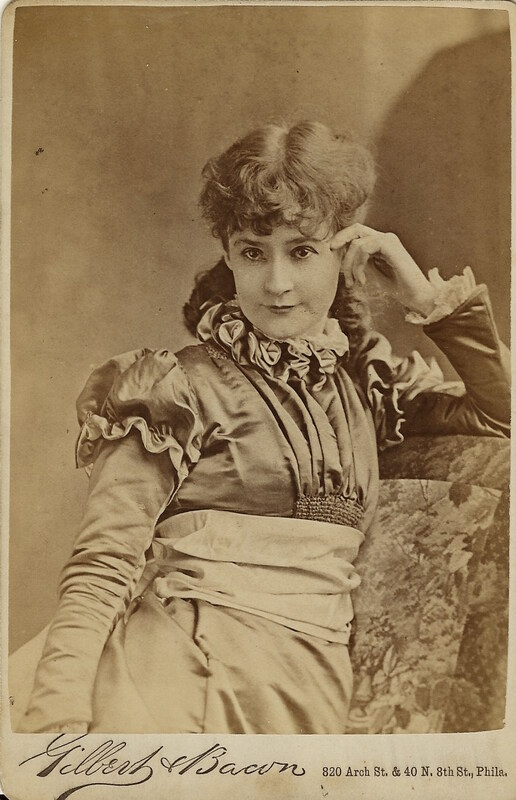 She studied acting in Paris and in 1876 spent five years playing roles in Continental Europe. 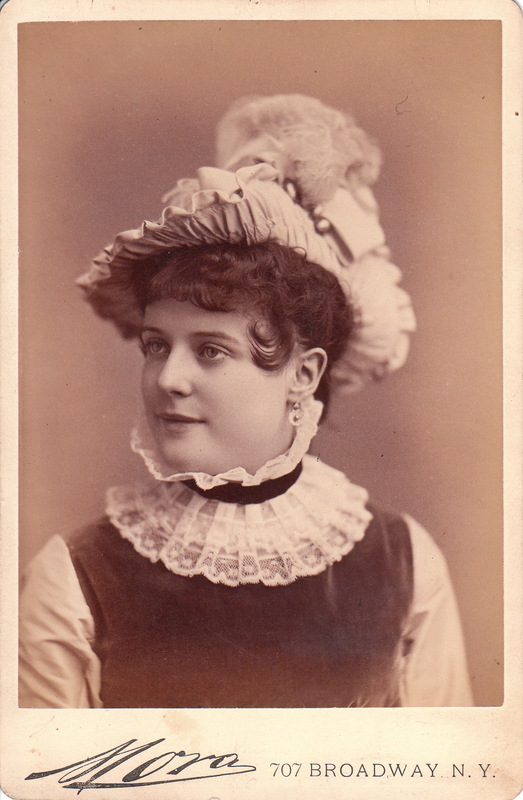 In 1881 she vacationed in England and decided to appear in British theater. She quickly learned English and in one months time, performed in Much Ado About Nothing in London. Shortly after, she travelled to America where she spent the majority of her remaining life. Her obituary in the New York Times indicates that her english was “somewhat incomplete” and he always performed with a pronounced french accent. She appeared frequently on the New York stage but was a fan favorite in the “provinces”. This very popular actress died in Montmorency, France in 1899. The second cabinet card is a portrait of Mlle. Rhea that was probably taken some years after the first cabinet card. The actress appears somewhat older than in the first image. 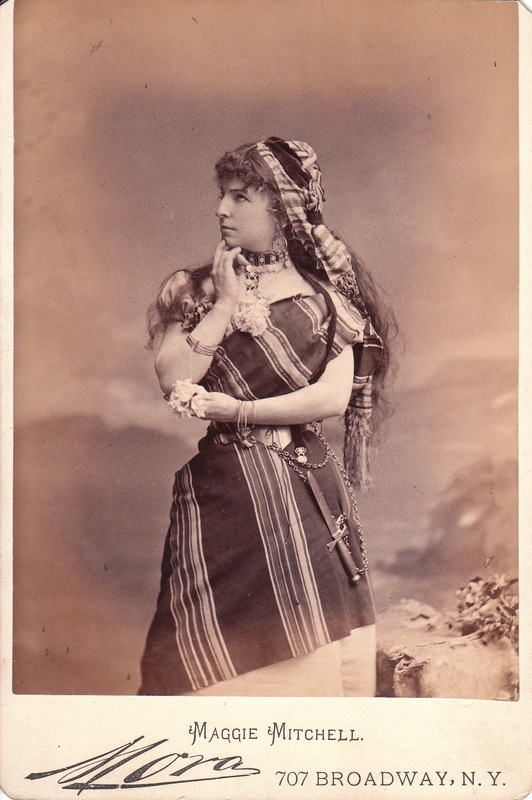 The second cabinet card was also produced by Mora. A pretty young woman sits on a faux rock as she poses at the Moreno studio in New York City. She is holding what appears to be an envelope in her hand but at first glance looks like bank check. This fashionable subject is very thin waisted and present herself in what the photographs previous owner called “a fetching pose”. Antonio E. Moreno was a Cuban painter and graphic artist who became a photographer after seeing the success of his New York based countryman, Jose Maria Mora (see category “Photographer: Mora”). In 1881, Moreno took over a failing New York City photographic studio. The business end of the studio was run by his co-director, Jose Lopez. Moreno developed the business into a great success due to his great talent as a photographer, developer and innovator. He became noted in photographic circles and received much acclaim from his participation in photographic expositions. He surrounded himself with talented co-workers. Much of his staff came from Mexico. Spanish cameraman Antonio Urda was considered to be excellent at his craft but was a fiery man who eventually committed suicide by drinking development fluid after failing to murder printer Domingo Costello. After this incident, Moreno preferred to hire English speaking Europeans to work at his studio. One of his hires was printer Nahum Lubosh whom he snared from celebrated photographer B. J. Falk (see category “Photographer: Falk”). Another employee, cameraman A. L. Simpson pioneered the use of slides utilized in theater sing-alongs. In 1890 Moreno partnered with the Taber Art Company in publishing photographs of beautiful female models in what has been described as “genre scenes and allegories”. The photographs were well posed, precisely lit and very tasteful. Moreno’s gallery was in business for a quarter of a century and was a center for performing arts portraiture. 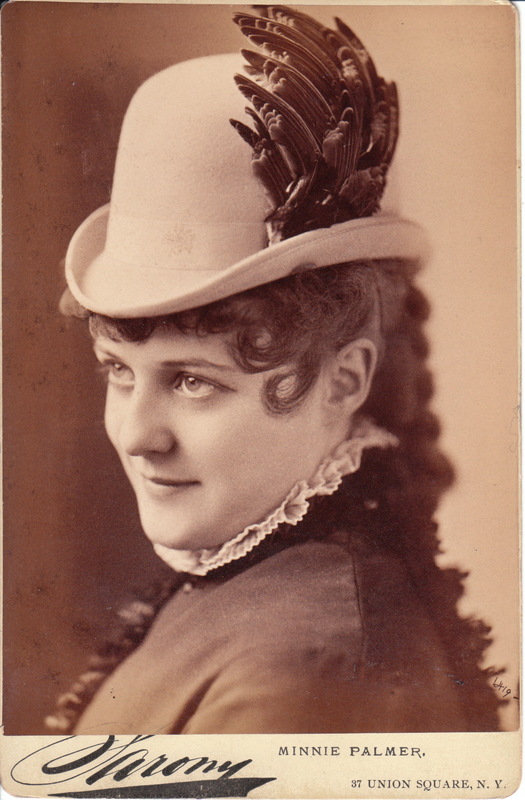 One wonders if the subject of this cabinet card portrait was in fact a theater actress. To view other photographs by Moreno, click on the category “Photographer: Moreno”. 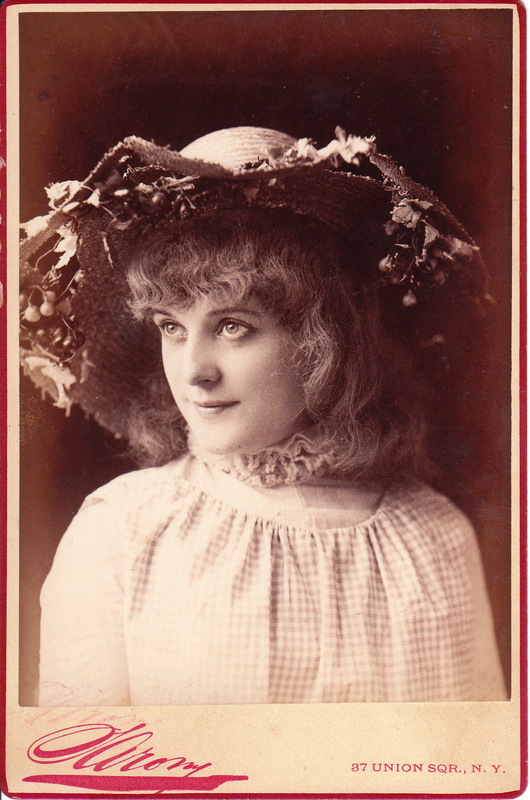 This cabinet card features a portrait of theater actress Lillian Conway. The image was produced by Jose Mora, the famous New York celebrity photographer. To view other images by Mora, click on the category “Photographer: Mora”. 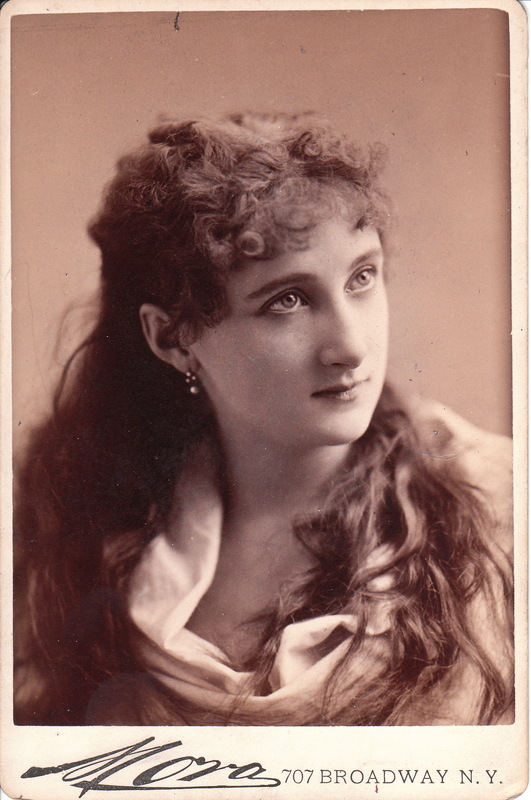 Lillian Conway was Brooklyn born and grew up in a theatrical family. Both her parents were appeared on the stage and her mother was also a theater manager. Lillian’s sister, Minnie, also was an actress. Lillian made her theater debut at the Brooklyn Theater playing a minor role in the burlesque “Evangeline”. She next appeared as the lead in “Virginius”. After her parents died, Lillian moved to Boston where she appeared in Globe Theater productions and next moved to Philadelphia to continue her theatrical career. While in Philadelphia, she met and married a local banker, left the stage, and had two children. The marriage had multiple problems including allegations that her husband was an alcoholic. She divorced her husband, who later died in 1887. Miss Conway returned to the stage and organized the Lillian Conway Opera Company. She took the “show on the road” but her theatrical group failed, partially due to scandal. It seems Lillian Conway was guilty of sharing a hotel room with the troupe’s unmarried business manager. Conway later fell ill, and with the help of the Actor’s Guild was able to finance a trip to London for treatment. Unfortunately, she died there in 1891 from rheumatic fever. 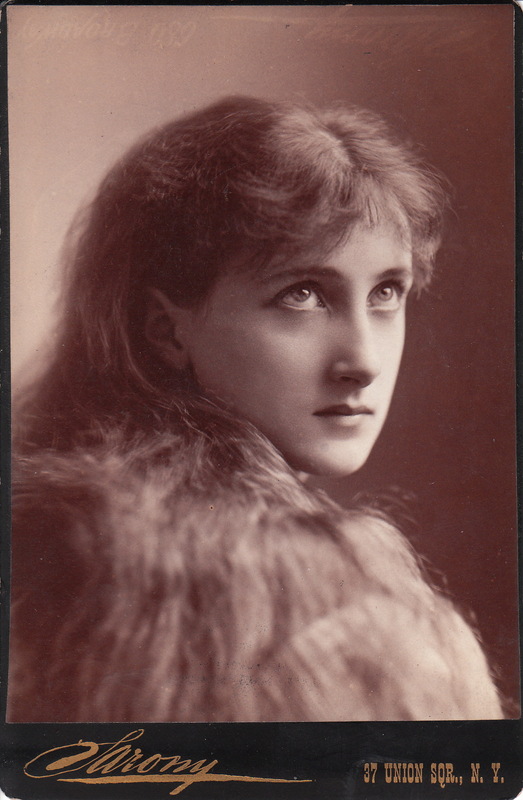 Maude Branscombe was a very popular stage beauty and light opera singer. She was reported to be the most photographed woman of her day. Biographical information about her is sparse and more will be added at a later date. 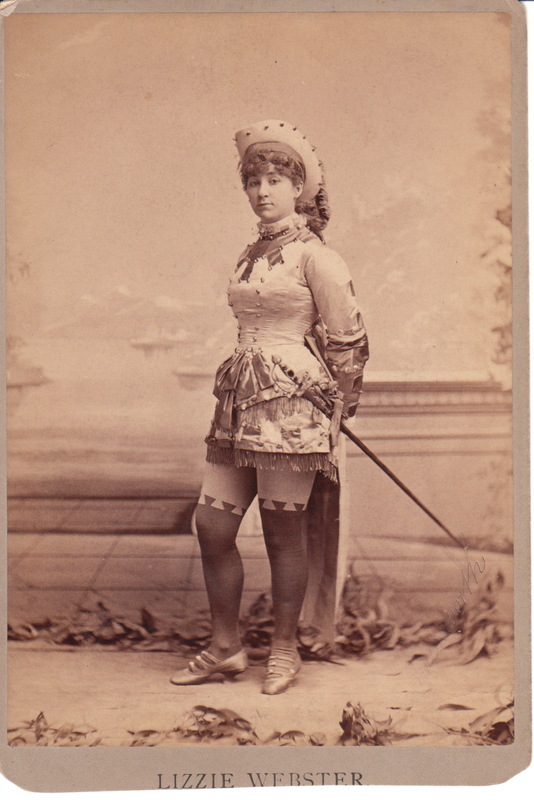 Her first appearance on the New York stage was in 1876 as Cupid in a revival of Ixion at the Eagle Theatre. The portrait at the top was photographed by renowned W & D Downey of London, England. The second portrait was cropped so the photographer is unknown. The third portrait (Branscombe is wearing a necklace) is by L. Levin & Son of San Francisco, California. The fourth cabinet card image was photographed by Sarony. Sarony was a well known celebrity photographer and more of his portraits can be viewed by clicking on the category of “Photographer: Sarony”. Sarony does an excellent job of capturing Branscombe’s beauty and her alluring eyes. The fifth and sixth, and seventh cabinet card were photographed by another celebrity photographer, Jose Mora, of New York City. Interestingly, the fifth and seventh cabinet card captures Branscombe in the same costume as the second cabinet card. It is likely that the photographer of cabinet card number two, is also Jose Mora. To view other photographs by Mora, click on the category of “Photographer: Mora”. 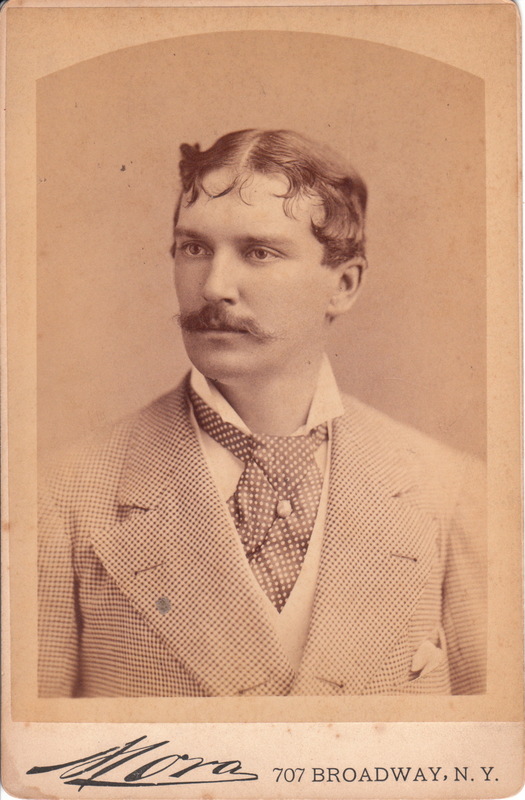 The eighth cabinet card portrait of Branscombe was photographed by Howell, another New York City photographer with a studio on Broadway. Howell’s close-up photograph captures the actress’s beauty and her wonderful eyes. She is wide eyed and her hair is a bit mussed. These qualities add to the allure of Miss Branscombe.William Roe Howell was born in 1846 in Goshen, New York. He had a passion for drawing and painting and he directed his creative interest into the field of photography as a young adult. He opened a photographic studio in Goshen. In 1863 he moved to New York City where he joined Robert and Henry Johnston at Johnston Brothers Studio at 867 Broadway. In 1866 the firm became Johnston & Howell. In 1867, he became the sole proprietor of the gallery. By 1870, he was gaining much recognition in the field of photography. His great location in New York City gave him access to many fashionable upper class men and women as well as many celebrities. Among his photographic subjects were P. T. Barnum, Buffalo Bill, and Robert E. Lee. He opened a branch studio in Brooklyn. In 1873 he came one of five Americans to be awarded a special grand prized at the Vienna World Fair. He frequently received mention in the photographic journals. He published a book of cabinet cards that received much praise. He became a photographer for West Point, Princeton, and other notable institutions. He won many medals at photography exhibitions. In 1878 he moved his business from 867 to 889 Broadway and opened another studio with a partner (Meyer) at 26 West 14th Street. In 1880 he retired from photography due to health reasons. In 1886 he moved with his family to Washington D.C. intent on opening a photography business there. He then disappeared. He vanished just two weeks before the grand opening of his new studio. He left his wife of 16 years (Fannie Scott) and his five children penniless. His wife stated that Howell was an eccentric man and that he must have got tired of business and family problems “and cut loose from us”. He apparently returned home after a short duration of absence and his business appeared in the 1888 Washington D. C. business directory but not in the 1889 directory. He died of tuberculosis in New York City in 1890. He had been residing at the home of a colleague who ran a photography studio in Harlem. It is believed by some biographers that he had divorced his wife and returned to New York without his family. The ninth cabinet card is another portrait photographed by Jose Mora. The actress’s costuming detracts from the overall appeal of the photograph. She seems lost in the swirl of her head covering. However, the photographer does an excellent job of highlighting Miss Branscombe’s seductive eyes. The phrase “Maude Branscombe eyes” certainly rivals the phrase “Bette Davis eyes”. Cabinet card number ten also comes from the studio of Jose Mora. She is well dressed in this portrait. It is not clear if she is dressed for a stage role or if she is attired for a jaunt around town. One wouldn’t think that a man could wear a checkered tie with a checkered jacket and still look dashing, but theater actor H. J. Montague is able to accomplish this feat. The photographer of this cabinet card portrait is theater specialist, Jose Mora. To view more of his celebrity photographs, click on category “Photographer: Mora”. The reverse of this image has an address and a return address as if it had been mailed. However, there is no stamp or postmark. 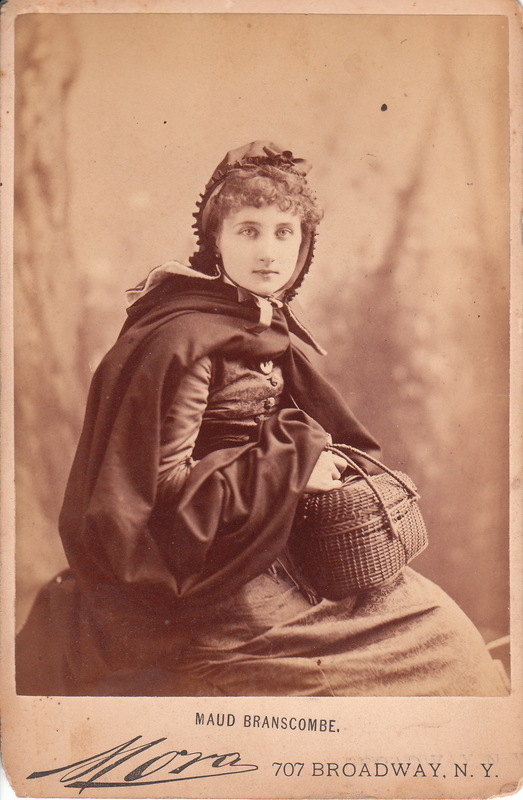 The photograph is addressed to a “Jane Mure” in Philadelphia, Pennsylvania. The script is written in very ornate calligraphy. Surprisingly, both the return and sending addresses have Philadelphia zip codes. Since zip codes are from the twentieth century (1963), it appears that someone may have added the ornate script to give the card more character but wasn’t aware, or not thinking about, the relative recent introduction of the zip code system. Henry James Montague (1844-1878) was the stage name of Henry James Mann. He was an American actor born in England. He appeared in T W Robertson’s comedies in London and in 1870 was a founder of London’s Vaudeville Theater. He came to the United States in 1874 and made quite a splash. He became a matinee idol. George Odell wrote that Montague was “a perfect specimen of refined English Manhood”. He was said to have “made other leading men seem boorish, ill dressed and possibly a bit vulgar”. Montague died quite young, about 34 years old. According to the New York Times (1878) while playing a role in a San Francisco production, he fell extremely ill from a “hemorrhage of the lungs”. He required medical attention from some theater goers and was taken to a hotel to recuperate. He rallied only briefly. During a visit from friends he became acutely ill and his last words as he was dying were reported to be, “It’s no use, I am going boys; God bless you”. The New York Times covered his funeral. Attendees of his funeral include the “A” list of that era’s theater world. Mourners included Lester Wallack, Kate Claxton, Rose Coghlan, and Maud Granger. The afore mentioned three actresses all have portraits that can be viewed in the Cabinet Card Gallery by utilizing the search box. These cabinet cards feature a portrait of theatre actress, Minnie Palmer (1860-1936). Palmer was born in Philadelphia and spent her early childhood in a convent. At age eight, her family moved with her to Vienna where she was taught music and German. She then went to Paris where she learned dancing and French. At age eleven, in 1876, she went to Baltimore, Maryland, and made her first stage appearance. 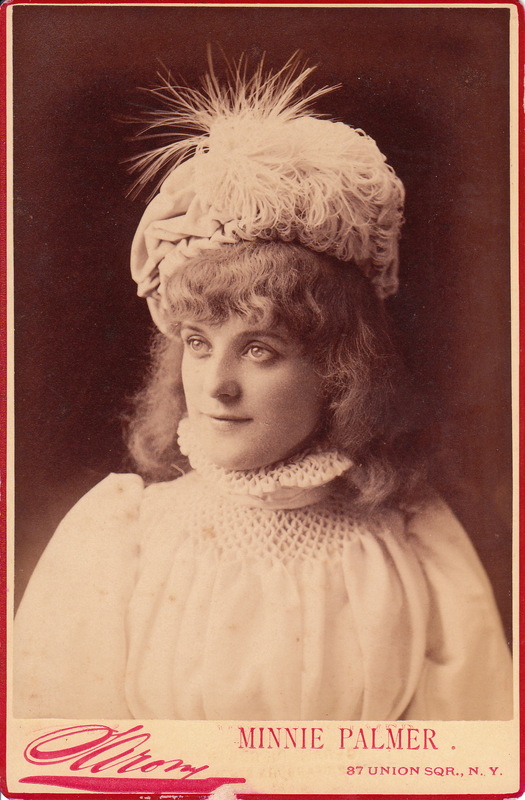 She then acted in Booth Theatre’s production of “Dan’l Druce”. This appearance was followed by roles in “Engaged“, “The Cricket on the Hearth” and other plays. She was very successful in “Two Orphans” and in the 1879-80 theatre season she had great notice in “The Boarding School” and “My Sweetheart“. Palmer also was successful at having aspects her personal life detailed in the newspaper. The New York Times (1890) reported her “narrow escape from death” when she was assaulted by her husband who brandished a huge carving knife. She received minor injuries to her face and her hand. Her husband, John Rogers, was also her manager. Rogers was angry because his wife had ignored his edict that she stay away from her mother. Apparently, upon her return from attending a horse show with her parents, Rogers attacked her. Rogers was a very possessive man; he had already written many insulting and abusive letters to Palmer’s friends in an effort to keep them away from her. Palmer was certainly not media shy. She gave the Times reporter a very detailed story about the violent incident and problems in her marriage which they were happy to print. The photographer of the top cabinet card is Sarony. The second cabinet card is a portrait by celebrity photographer, Mora. Both photographers were located in New York City. To see other photographs of these talented celebrity photographers, click on Cabinet Card Gallery’s category “Photographer: Sarony” and “Photographer: Mora”. 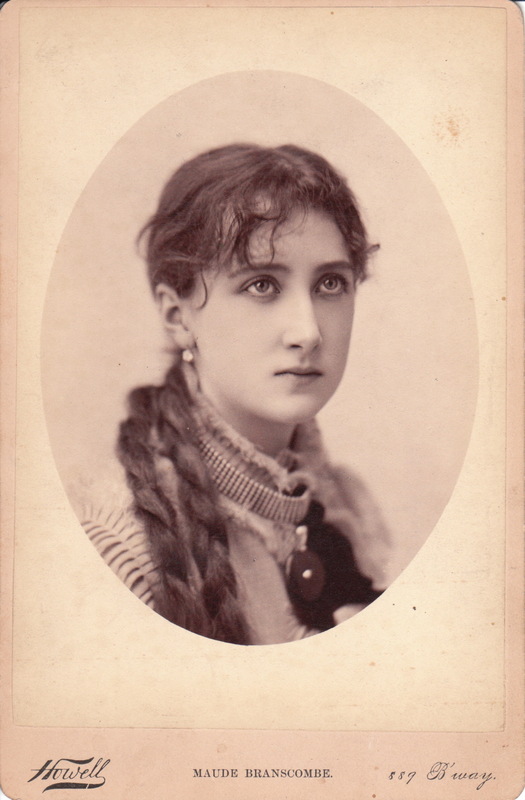 The third cabinet card is by Sarony and it does a great job of capturing Minnie Palmer’s exceptional beauty. 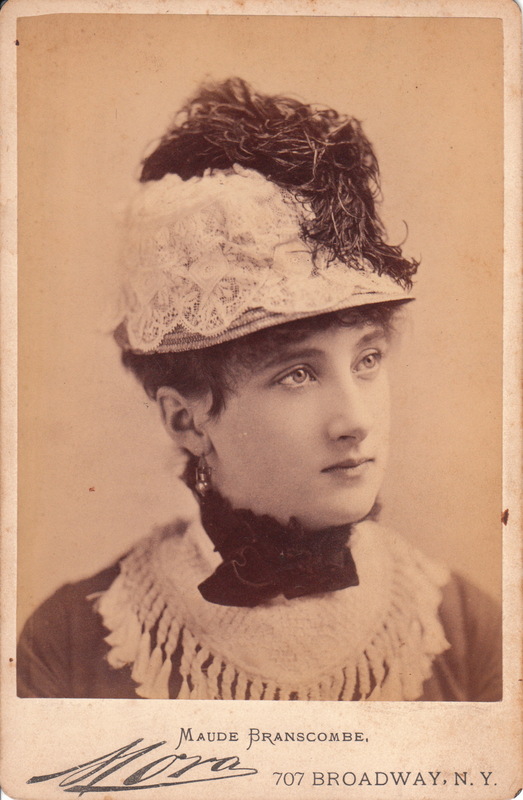 The fourth cabinet card, also by Sarony, is a close-up portrait of Miss Palmer wearing a feathered hat. Once again, Minnie Palmer is quite photogenic. She has sparkling beautiful eyes and a wonderful smile. 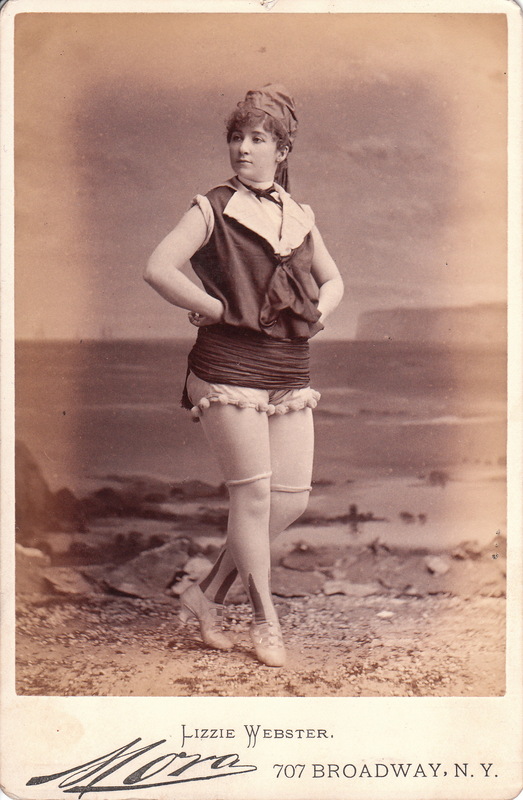 The top cabinet card features theatre actress Lizzie Webster posing at the beach. OK; its not the beach, but it is a fake beach, at the studio of celebrity photographer, Mora, in New York City, New York. Webster appeared on the American stage in the late 1870’s and early 1880’s. She appeared on tour in Edward Rice’s popular show, “Evangeline”. The Brooklyn Daily Eagle (1878) described Miss Webster as a “shapely brunette”, and a “beautiful being”. However, the article states that she did not possess a good voice. In 1893, Lizzie Webster died in Milwaukee, Wisconsin. To see other photographs by Mora, click on Cabinet Card Gallery’s category “Photographer: Mora”. 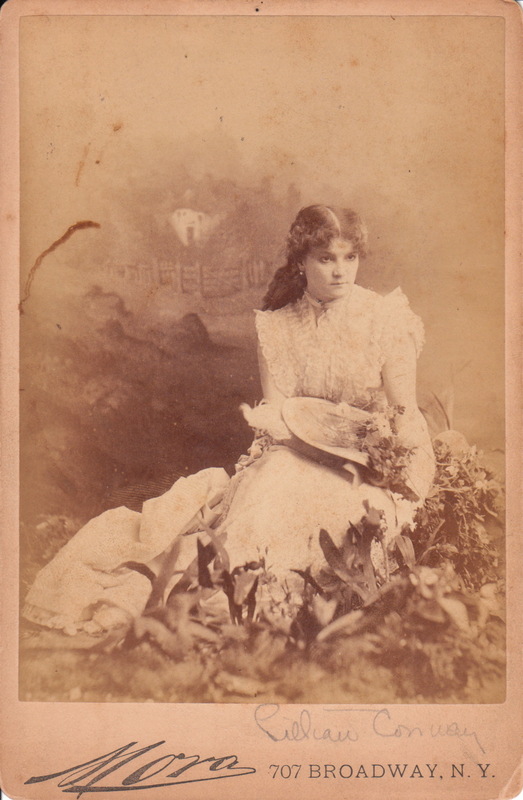 The second cabinet card features Miss Webster in costume, complete with a sword at her side. This image as well as the top image demonstrates that Lizzie Webster was not too modest to exhibit her legs. Both photographs are a bit risque because of this immodesty. 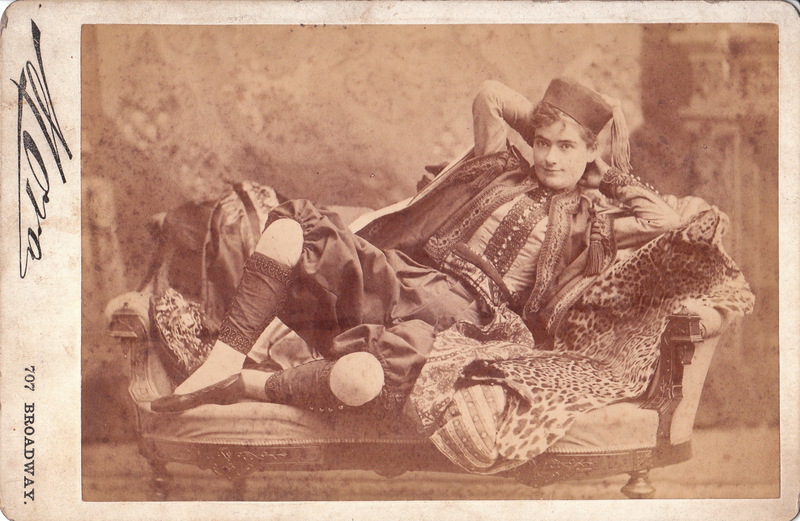 The photographer of this image is unknown because the photograph has been trimmed and the reverse of the photo card has a large sticker covering much of the cards back. The sticker identifies the photograph as the property of Culver Pictures of New York City. The firm owned the rights to the image and would allow the media to use the image, if they paid for the privilege.